Are you looking to explore the outdoors, stay close to home, and enjoy a free event? Look no further! Just 15 minutes from the bustling scene of downtown Portland awaits a forest in the city for you to discover. 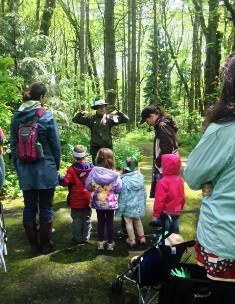 Join us at Tryon Creek State Natural Area! This program integrates nature exploration, art, literature, music, movement, and outdoor play. It is geared toward families with young children (preferably ages 2-6) but all are welcome. Space is on a first come; first served bases. Register in the Nature Center 30 minutes before the program starts. See our schedule or call (503) 636-9886 ext. 225 for details. Venture out with a park guide for a free, nature hike to explore the forest and stream ecosystems and natural history at Tryon Creek State Natural Area. Topics will vary from week to week but will be appropriate for all ages. Parents must accompany kids on all hikes. No groups please– if you are interested in bringing a group please call the ranger at least two weeks in advance to make arrangements for alternate time. See our schedule or call (503) 636-9886 ext. 225 for details. All ages, free, and no registration required.